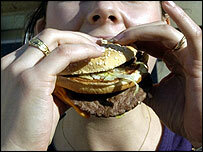 A formula added to food could have the potential to extend the lives of obese people by 20%, scientists believe. Finnish researchers found the formula of plant sterols and mineral nutrients extended the lives of obese rats by 60% when it was mixed with fatty food. The increase in lifespan was caused by the composition lowering cholesterol and blood pressure levels, the team at the University of Helsinki said. But experts said rat studies did not always transfer well to humans. The benefits of plant sterols, which are added to some margarines, are already known. But the scientists said it was the combination of the sterols and the nutrients - calcium, potassium and magnesium - which had an effect. The team found the rats which were fed high-fat, high-salt diets with the enrichment formula, given the name MultiBene, lived longer than those which were not. It is thought the formula helped improve the function of blood vessels. The formula also helped to combat obesity but the effect was not as "surprising" as the increase in lifespan. Professor Heikki Karppanen, the lead adviser on the study, said while he did not think the 60% figure could be repeated in humans, 20% could easily be achieved. "MultiBene could in theory be added to nearly any food and even drinks and if it was I am confident we would see a similar affect. "But the problem with industrialised food is that this is probably not possible to add MultiBene when food is produced on such a mass scale. "I suppose in the end people should just change their diets." But Professor Anthony Barnett, head of the University of Birmingham's diabetes and obesity group, said it was not always possible to equate rat and mice tests to humans. "It is an interesting study but does not necessarily mean we will seem the same results in humans. "In reality a person will have to eat such large quantities to have any significant effect. "And really there is not substitute for exercise and healthy eating. "To get a 20% increase in life expectancy an obese person would have to lose 10kg in weight and keep it off for five years."